WARSAW, Ind., (WANE) – He’s led the Ku Klux Klan , and founded his own white supremacist group. Now, Tom Metzger wants to add “congressman” to his controversial resume. The Warsaw, Indiana native is campaigning for the Third District Congressional seat held by Mark Souder . Metzger touts himself as pro-union and the candidate for the working class. He tells NewsChannel 15 that he is ready to shake up Washington. Metzger is no stranger to politics. In 1980, he actually won the Democratic Party’s nomination for the U.S. House of Representatives in San Diego. He later lost in the general election to the Republican incumbent. In 1982, he received three percent of the vote during a United States Senate run in the Democratic Party Primary. Metzger knows his chances of winning the race are slim, but he hopes to at least make a statement. Congressman Souder’s office declined to comment on this story. The New York Daily News reported that n 1989, Metzger was ordered to pay $5 million for intentionally inciting skinheads in Portland to provoke confrontations with minority groups. He also was sentenced to jail for six months in 1991 for taking part in a cross burning. Metzger’s anarchist group openly promotes ideas such as racism, the use of abortion as a means of “non-White population control,” and the collapse of the U.S. government. The logic is perfect. Very little abortion should be tolerated, among our White race, while at the same time, abortion and birth control should be promoted as a powerful weapon, in the limitation of non-White birth. Overt support of both non-White population control and non-support of abortion for Whites, has the same desired effect. Promoting this Third Force position confuses and angers the churches, with their anti-abortion position,… Covertly invest into non-White areas, invest in ghetto abortion clinics. Help to raise money for free abortions, in primarily non-White areas. Perhaps abortion clinic syndicates throughout North America, that primarily operate in non-White areas and receive tax support, should be promoted. 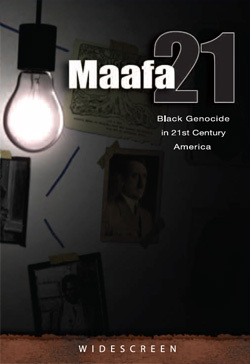 This verifies with the information documented in the the film: Maafa21 Black Genocide in 21st Century America. Everyone needs to see this movie and realize that abortion is a tool for Black Genocide. Margaret Sanger herself spoke to the Klan and received a dozen additional invites, she admits this in her autobiography.